my ramblings | expressions: The Leaning Tower of... Pisa? The Leaning Tower of... Pisa? This is the latest research from inova! 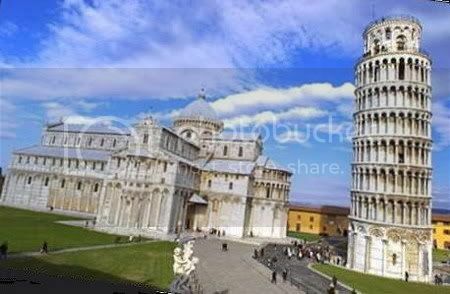 Due to an abberation in the earth’s magnetic/gravitational force, scientists, geologists and architectural historians verified long held theories that the famed Leaning Tower of Pisa does not actually lean at all, and that it is actually the adjacent Duomo that does. Geotechnical engineer and astrologist Bobby Bieber BFD released the details of the findings to the UK Telegraph. Mr. Bieber stated that the “leaning” of the tower is actually an illusion accidentally perpetrated by the thousands of visitors to the historic site. Geotechnical analysis is now underway to correct the Leaning Duomo of Pisa. uh... can you find the United States on a map?